Alice Sparberg Alexiou is the author of Jane Jacobs: Urban Visionary and The Flatiron: The New York Landmark and the Incomparable City That Arose with It. She is a contributing editor at Lilith Magazine and blogs for the Gotham Center. 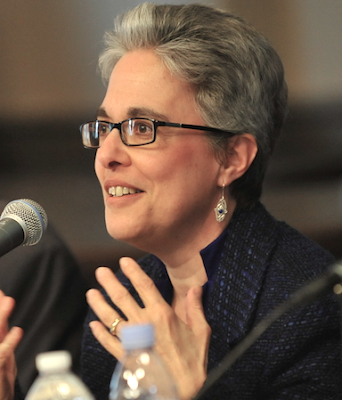 A graduate of Columbia University’s Graduate School of Journalism, she earned a Ph.D. in classics from Fordham University. 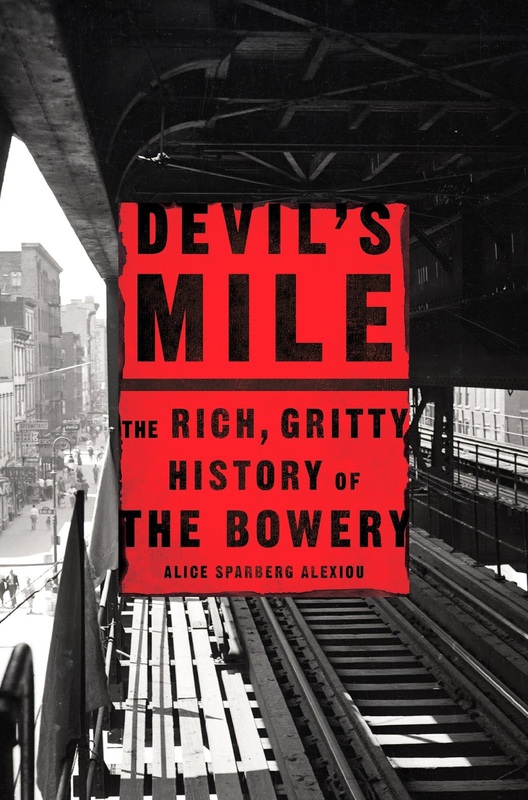 Her latest book, Devil's Mile: The Rich, Gritty History of the Bowery, deftly guides the reader through a place that has always been an integral part of Manhattan. Stay Thirsty Magazine invited Alice Sparberg Alexiou to participate in our One Hundred Words project with exactly one hundred words on topics we drew from her latest book. ALICE SPARBERG ALEXIOU: In the beginning New York’s merchant classes tried importing highbrow culture to the new, raw city that was making them rich. But how could the stuffy theater and opera they were bringing from England compete with dives where blacks and Irish danced and drank together and theaters showing outlandish melodramas and all the other the low-brow art forms then taking shape on the Bowery, for and by the masses? No doubt about it, the Bowery won New York’s original culture war, and then set the tone for all American popular culture, which eventually crossed the oceans and conquered the world. ALICE SPARBERG ALEXIOU: Before the Europeans arrived in Manhattan, the island was a paradise of marshes and forests, populated by Indian tribes. The next time you trudge down the noisy and very hip length of the Bowery, know that this street was originally a Lenape trail, which the Dutch settlers discovered as soon as they set foot in Manhattan—1626—and immediately ruined. They widened it to use as a major artery, and hacked away at the adjoining forests to start farms—“bowerij” in Dutch—thereby ruining the lives of the Native Americans who’d been living off this land for thousands of years. STAY THIRSTY: Stuyvesant, Delancey and Astor. ALICE SPARBERG ALEXIOU: Three Dead White European Men who conquered Manhattan back when it was virgin territory, reminders of whose once commanding presence survive today mostly in the form of such New York place names as Astor Place, Delancey Street, and Stuyvesant Town. My favorite among the three men is old Peter Stuyvesant, who, after working so hard to tame the unruly Dutch colony of New Amsterdam, refused to hand it over to the conquering British in 1664 until his son Balthazar told him: “Dad, give it up.” Stuyvesant died on his Bowery estate, which stood on where is now St. Marks Church. ALICE SPARBERG ALEXIOU: Beginning in the 1880s, the Bowery had a rollicking gay bar scene. “Fairy resorts”—a resort then denoted not a Caribbean all-inclusive, but any place where people went to have a good time--had names like “The Slide” and “Paresis Hall” (paresis being the term then to denote syphilis), where young boys dressed up pretty and entertained male clients who travelled down to the Bowery from the swell neighborhoods uptown. Which meant that 120 years before Stonewall, there were people who understood that sexuality exists on a spectrum. But in the early 1900s, the cops closed down the fairy resorts. ALICE SPARBERG ALEXIOU: Along the mid-19th century Bowery, a black teenager nicknamed “Juba”--after a dance performed by African slaves-- was so renowned for his hoofing abilities that he was allowed to perform before white audiences—unheard of in those times. At the Bowery Theatre, now the site of a luxury hotel, he entered into a dancing contest with John Diamond, an Irish-American famous for his rendition of the jig. Juba had a talent for copying other dancers’ steps, and then adding flourishes of his own. The consensus was that Juba won the contest, and so was “tap dancing” born—on the Bowery. ALICE SPARBERG ALEXIOU: Park Row marks the Bowery’s southern terminus. It’s such a complicated street geographically, because a bunch of other streets converge there, as once did several branches of the smoke-belching, screeching El. The trains ran up and down those streets, before snaking around and coming together at the huge Park Row Terminal, which was demolished in 1944. Just to the west of the terminal, all New York’s great newspapers—the Times, the Herald, the Tribune—once had their headquarters, in clunky brick high-rise buildings that were the precursors of steel-framed skyscrapers. That’s why Park Row was then also called Printers Row. ALICE SPARBERG ALEXIOU: An evangelical group that started in London and opened its first American mission on the Bowery in the late 1800s, because everyone knew that the notorious thoroughfare was teeming with poor, drunken souls that desperately needed saving. And the rest, as they say, is history: who hasn’t at one time donated clothes or old furniture to the Salvation Army? Every year in New York, we know that the Christmas season is officially here when we spot the Salvation Army soldiers on the sidewalk next to their collection buckets, jingling bells at us as we rush by, to catch our attention. ALICE SPARBERG ALEXIOU: Yiddish theater started on the Bowery: in the 1880s, Jews from Lemberg and Odessa and Romania brought their acting chops with them to New York and rented space in Bowery theaters for cheap. And boy-oh-boy did they draw crowds: Imagine all those homesick, sweat-shop slaving speakers of Yiddish, crowding into shabby Bowery theaters on a Saturday night. For a quarter, they laughed, sobbed, and kvelled over their lantsmen performing in schlocky melodramas and Yiddish versions of Shakespeare—in America, the Golden Land! It felt like a miracle. I’m certain that my Russian grandparents, Yussel and Rivkeh, were among the audience. STAY THIRSTY: Drunks and bums. ALICE SPARBERG ALEXIOU: The Bowery once belonged only to bums and drunks. They’d stake a place on the sidewalk or in a dive bar, to drink and forget. In 1961, two NYU students made a 35-mm, 12-minute film they called “How Do You Like the Bowery?” They asked this question to every Bowery bum they met. When they asked one of the guys how he ended up there, he said one day, while he was backing his car out of his garage, he accidentally ran over his wife and killed her. His story broke my heart, but I wondered if it were true. ALICE SPARBERG ALEXIOU: Punk Rock started on the Bowery at a shithole bar underneath a flophouse that entrepreneur Hilly Kristal opened in the early ‘70s. He called the place CBGB’s, and all the greats like Patti Smith, Debbie Harry, and the Ramones performed there before they cut record deals and became famous. Punk was such an original sound, absolutely the product of 1970s New York, when dirt, graffiti and crime was everywhere; people were afraid to ride the subways. But it is in precisely those circumstances that art flourishes. Punk was the Bowery’s gift to New York during these dark and vibrant years.